Mediterranean Chicken Flatbread is a mouth-watering lunch or it’s even filling enough for dinner too! Happy Labor Day Weekend. . . this recipe will also make a fabulous picnic lunch! Miss Nichole from Pure Clean Fitness is here to hang out with us. I love having her visit and inspire our fitness! A Healthy Recipe, Mediterranean Chicken Flatbread from me + Tips for buying Gym Clothes from Nichole = a healthy, happy, and balanced life! Mediterranean Chicken Flatbread starts out with a fresh whole grain flatbread, then a smear of humus, and layers of cucumber and thinly sliced red onion, followed by grilled chicken breasts, cilantro, and lemon wedges. Finally, the Yogurt Cucumber Sauce is the mouth-watering finish to the whole meal experience! Wow. . . they’re SO good!! I recently took these Mediterranean Chicken Flatbread to my daughter and her husband when my new little grandson was born and they loved them! They are simple to make, have lots of fresh ingredients, and make healthy taste sinfully delicious! Miss Nichole’s Gym Clothes Tips. . . It seems like the gym as become quite the runway these days. I will be honest, I switched from a big box gym to a family friendly rec center. It is a much tamer runway but can still be a runway. With so much focus on being cute and stylish we sometimes forget about some of the more important reason we buy workout clothes, to actually workout in them. 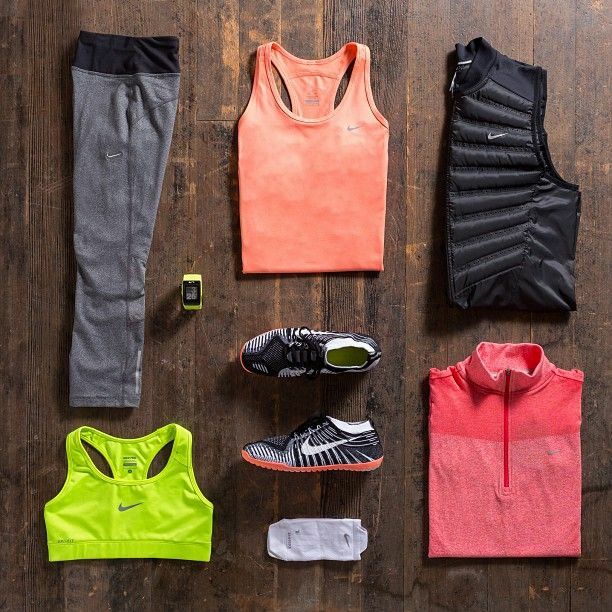 Today’s Fit Friday is all about tips for finding good workout clothes. 1) First and foremost think of the activities that you are wanting to do. Different activities require different types of clothes and support. You don’t want to wear a less supportive yoga sports bra when you hit the trails for a 6 mile trail run. 2) Try it on! I hate trying on clothes but with workout clothes it is a must. If a top is too tight I am not going to workout in it because it is going to make it hard to breathe and/or I will be way to self conscience. If my shorts are a bit too baggy I know that I will constantly be pulling them up and they will soon end up at the bottom of the drawer. If there is a seam that rubs wrong it will drive me crazy every time I move and once again an article of clothing will be shoved to the bottom of the drawer. 3) Breathable fabric. Cotton is not a good type of material to workout in! You want fabric that will breathe and not collect sweat. 4) Don’t buy it if you won’t wear it! All the cutsie patterned shorts are adorable, but if you know that you are a black shorts girl stick with the black shorts. Workout clothes are expensive, spend your money wisely folks! Mediterranean Chicken Flatbread will make your Labor Day weekend even more fabulous! Place flatbreads on serving plates, spread 1/4 cup humus on each. Then divide cucumber, red onion, and chicken on flatbreads. Garnish with cilantro leaves and lemon wedges. Combine all ingredients in a small mixing bowl; mix to combine. This is what I have been looking for. Something light but fulfilling. It layers of cucumber and onion is good enough for me. Will definitely make this soon. Thank you for sharing this wonderful recipe.